Amino acids are the building blocks of proteins and found in structural tissues of the human body. Their deficiency may cause a number of diseases. 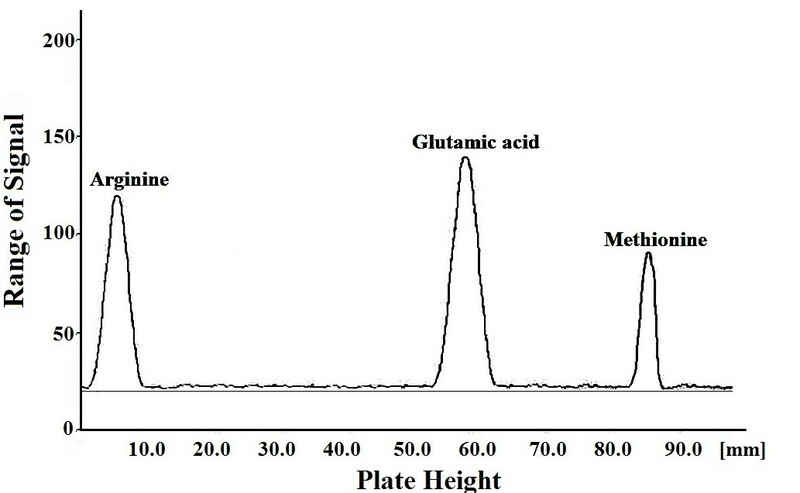 Amino acids were analysed by the proposed thin layer chromatographic system using silica gel as stationary phase and Ethanol/70% aq. ethylene glycol/acetone (5:3:1) as mobile phase. Separations of some closely related amino acids from their quaternary, ternary and binary mixtures were achieved. The limits of detection of the separated amino acids have been calculated. The effects of presence of metal cations and anions on the separation have been examined. The developed method has been successfully applied for identifying the amino acids (lysine and methionine) in pharmaceutical formulations. Thin layer chromatographic technique using silica as stationary phase in combination with mixtures of environmentally preferable solvents as mobile phase has been used for the analysis of amino acids of pharmaceutical importance. Amino acids are the building blocks of proteins and found in structural tissues of the human body (Bromley et al. 2008; Castellino et al., 1987). A number of fascinating roles associated with amino acids include pH regulation (Wang et al. 2008) neurotransmitter functioning (Roberts 1974) pain control, cholesterol mechanism, inflammation control, detoxification, regulators of gene expression (Wu 2009) etc. Their deficiency may cause certain diseases such as, gastrointestinal insufficiencies, inadequacy of proteins, inflammatory responses, detoxification impairments, cardiovascular disease, neurological dysfunction, and inborn errors of metabolism etc. Because of these reasons the analysis of amino acids to ascertain their presence in matrices is of great importance. Solvents being important components of chemical reactions and processes have an impact on cost, safety and health issues (Reichardt 2007). The toxic organic solvents used in any chemical process if released in the atmosphere, adversely affect the quality of environment. Therefore, the term green chemistry came into existence in 1990 to address environmental issues in an economically profitable manner. Green chemistry is commonly presented as a set of twelve principles proposed by Anastas ( and Warner 1998). The reason of using green solvents is to reduce the environmental impact resulting from the use of solvents in chemical production. Being biosolvent, ethanol has been safely used in perfumes, make-up products, wine and liquor (Buchanan et al. 1988; Scherger et al. 1988). Thus, it can be a better alternative as a solvent for Thin Layer Chromatography (TLC). Acetone is naturally found in trees, plants and as a by-product of the breakdown of body fat showing low toxicity (Macdonald and Fall 1993). Ethylene glycol can be produced using renewable biomass (cellulose and polyols) which could be a burgeoning area for future research due to its environmental friendliness and long-term economical advantages (Zhao et al. 2013). It is a simple diol containing two hydroxyl groups in adjacent positions along a hydrocarbon chain, non-volatile and completely miscible with most of the polar solvents and slightly soluble with some non polar solvents showing low toxicity. Being an excellent solvent, its several attractive applications in various chemical fields such as plasticizers, elastomers, corrosion inhibitors, detergents for equipment cleaning and inks for ball point pens, etc. Considering low toxicity, we have used these solvents for achieving separations of amino acids. Due to various attractive features of thin layer chromatography such as open and disposable nature of TLC pates, wider choice of selection of stationary and mobile phases, reduced need of modern laboratory facilities, minimal sample cleanup, use of small amount of sample for analysis, this technique has been used for the analysis of amino acids. During present study, we have designed the best combination of environmentally preferable solvents as mobile phase for silica thin layer chromatography of amino acids. Chromatographic parameters have been calculated for achieved separations of amino acids and the practical applicability of developed TLC method has been illustrated by identifying the presence of amino acids in pharmaceutical formulations. All experiments were performed at 25 ± 2°C. A TLC applicator (Toshniwal, India) was used for coating SIG on 20 cm × 3.5 cm glass plates. The TLC was performed in 24 cm × 6 cm glass jars. Micropipette (Tripette, Germany) (0.1-1.0 μL) was used for spotting of analytes. A glass sprayer (Borosil, India) was used to spray reagent on the plates to locate the positions of the spots of analytes. All chemicals were of analytical reagent grade. Silica gel G, methanol, ethanol, propanol, butanol, pentanol, acetone and ethylene glycol were purchased from Merck, India. Ninhydrin, amino acids (leucine, isoleucine, phenylalanine, tyrosine, alanine, lysine, proline, serine, glutamic acid, methionine, arginine, histidine, tryptophan) were purchased from Central Drug House, New Delhi, India. Water used in these experiments was double distilled water. Test solutions of amino acids (1% w/v) were prepared by dissolving 0.1 g of amino acids in 10 mL of double distilled water. Ninhydrin solution (0.3% w/v) in acetone was used to detect all amino acids. Silica gel G was used as stationary phase and following solvent systems were used as mobile phase in all experiments. The details of preparation of TLC plates and chromatographic procedure can be seen elsewhere . For separation, equal volumes of amino acids to be separated were mixed and an aliquot (0.1 μL) of the resultant mixture was loaded onto the activated TLC plate. The plates were developed with selected mobile phase M11, the spots were detected and the RF values of the separated amino acids were calculated. The limits of detection of separated amino acids were determined by spotting 0.10 μL of amino acids solutions on the TLC plates which were developed with mobile phase M11 and the spots were visualized using ninhydrin. This process was repeated with successive reduction in the loading volume. The amount of amino acid just detectable was taken as the detection limit. It is estimated that half of all proteins contain a metal. These metalloprotiens play different functions in cell such as storage, transport of proteins, enzymes etc. Hence, chromatographic behaviour of amino acids was supposed to change in the presence of metal cations, anions and vitamins. Therefore it is important to observe the effect of these species as interferences on the separation of amino acids. To examine this, an aliquot of 0.10 μL of foreign substance (cations, anions or vitamins) was spotted on silica layer followed by the spotting of the mixture (0.10 μL) of amino acids. After drying the spot, TLC was performed with mobile phase M11 and RF values of separated amino acids were calculated. Syrup (0.10 ml) of All-B (containing lysine) and drug Beplex-forte (containing methionine) were dissolved in 10 ml of demineralised water. Aliquot (0.10 mL) of the resultant sample was loaded onto TLC plates and developed with mobile phase (M11), followed by drying and spraying of ninhydrin solution. Similarly, drug sample solutions (1.0 mL) of All-B syrup was mixed with solutions (1.0 mL) each of proline, alanine, and tyrosine and beplex-forte with solutions (1.0 mL) each of arginine and glutamic acid to prepare synthetic samples and an aliquot (0.10 mL) of the resultant mixture was loaded onto TLC plates and developed with M11, chromatography was performed on these spiked drugs samples for the identification and separation of amino acids in quaternary mixture. Each 10 ml contains: Thiamine hydrochloride (2 mg), riboflavin sodium phosphate (2 mg), pyridoxine hydrochloride (0.75 mg), nicotinamide (15 mg), D- panthenol (3 mg), L- lysine hydrochloride (70 mg), sorbitol solution 70% qs and sunset yellow FCF. Each 10 ml contains: Choline chloride (9.1 mg), DL- methionine (9.1 mg), D-panthenol (9.1 mg), inositol (4.5 mg), niacinamide (90.9 mg), vitamin B1 (90.9 mg), vitamin B12 (90.9mcg/1 ml), vitamin B2 (4.5 mg), vitamin B6 (4.5 mg). Results of this study have been summarized in Tables 1, 2, 3 and 4 and shown in Figures 1, 2, 3, 4 and 5. Several combinations of environmentally preferable solvents have been used for observing the migration behaviour of amino acids and some closely related amino acids have been identified and separated from their multi component mixtures. *Each value is an average of four replicates. Densitographic presentation of representative separation of two-component mixture of amino acids. Densitographic presentation of representative separation of three-component mixture of amino acids. Densitographic presentation of representative separation of four-component mixture of amino acids (Digital photograph of the separation achieved alongside). 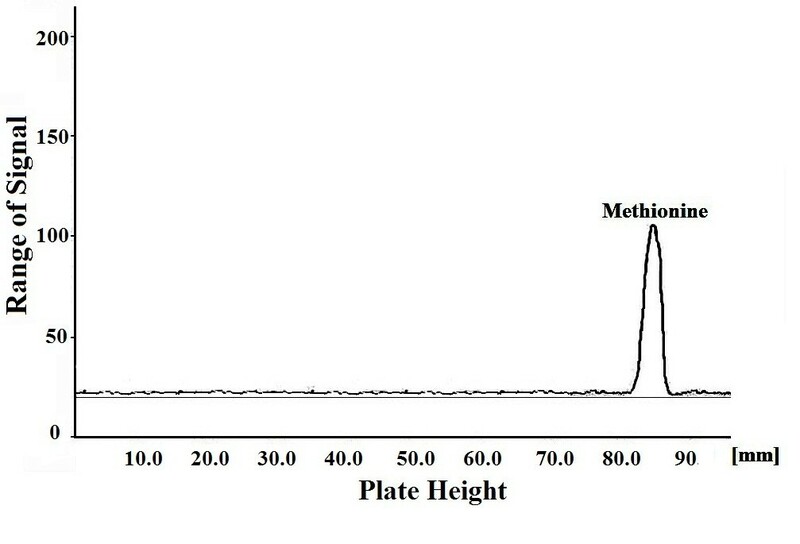 Densitographic presentation of detection of methionine in Beplex forte drug sample. 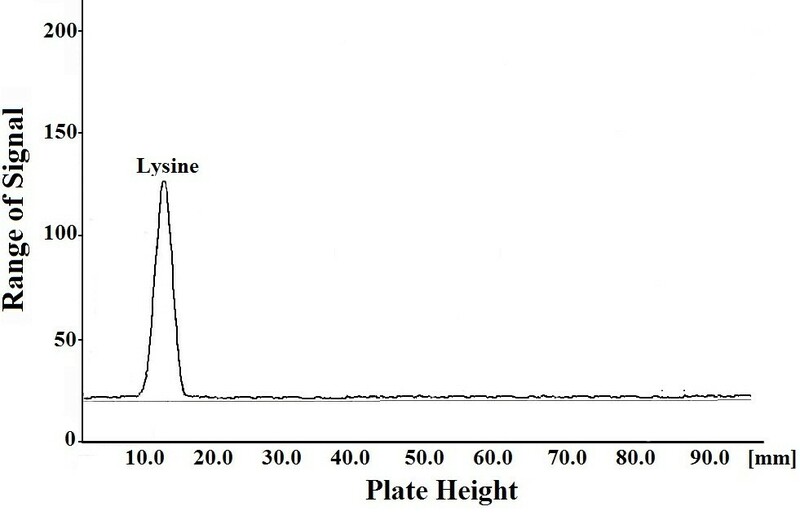 Densitographic presentation of detection of lysine in All-B syrup sample. When pure ethylene glycol (M1) is used as mobile phase for examining migration behaviour of amino acids on silica gel, all amino acids reached the maximum allowed distance, showing RF in the range of 0.92-0.99. In case of ethanol (M2) as mobile phase, tailing in the spots of all amino acids was observed while none of the amino acids leaves the point of application. It may be probably due to competitive interactions of amino acids with ethanol and silica gel. With acetone (M3) as eluent, all amino acids remained near the point of application as compact spots. RF in ethylene glycol containing two OH groups in the molecule > RF in ethanol containing one OH group > RF in acetone with absence of OH group. This trend is in consonance with the dielectric constant of the mobile phase. The dielectric constant values given in parenthesis is in the order ethylene glycol (37) > ethanol (24.2) > acetone (19.8) which shows the highest solubility of amino acids in ethylene glycol as reflected also by the high RF values of all amino acids. From the above discussion, it is clear that single component mobile phase is not capable to resolve amino acids from their mixtures but from the differential migration of amino acids in individual mobile phase, it is expected that mixed solvent systems consisting of different proportions of components may prove useful for resolving amino acids from their multi-component mixtures. With this hope, different combinations of mixed solvent systems were examined to realize most appropriate system for reliable separation of amino acids. Ethanol and ethylene glycol mixed systems in different combinations (M4-M6) were used and obtained results are listed in Table 1. From the results it was observed that ethanol-ethylene glycol (7:3, M6) gives the most satisfactory results in terms of differential mobility pattern of amino acids. With this mobile phase, amino acids with positively charged side chain remained at the point of application except histidine which is due to the presence of imidazolium ring in its structure which is responsible for little mobility. By using this mobile phase, little mobility was observed for polar amino acids while non polar amino acids shows high mobility showing RF in the range 0.54-0.78. But the spots obtained with this mobile phase shows diffused boundaries. To overcome this problem small amount of acetone was added in ratio 5:3:2, to make the volume 10 ml. By adding acetone, compact spots were obtained showing improved separation possibilities. Due to the viscous nature of ethylene glycol, time taken by the mobile phase M7 was too much (4 h). In order to decrease the development time, aqueous solution of ethylene glycol in different concentrations (M8-M10) were used in place of pure ethylene glycol, along with ethanol and acetone. With M8 and M9 as mobile phase, spots of amino acids were large and tailing in case of serine was observed. Among them, M10 was most effective because of achieving compact spots with no tailing in case of serine. Improved separations of amino acids from their ternary and binary mixtures were possible with this mobile phase. But our aim is to resolve amino acids from their quaternary mixture along with ternary and binary mixtures, therefore volume of acetone was varied from 1 ml to 3 ml (M10-M12) (Table 1). From the table it was clear that only mobile phase M11 was able to separate four component mixture of amino acids along with ternary and binary one which was not possible in case of M10 and M12. Because of getting differential mobility pattern of amino acids and maximum possibilities of separations, M11 was selected as the best mobile phase for resolving amino acids from their quaternary, ternary and binary mixtures (Figures 1, 2 and 3). The amino acids present in each mixture are easily separable. 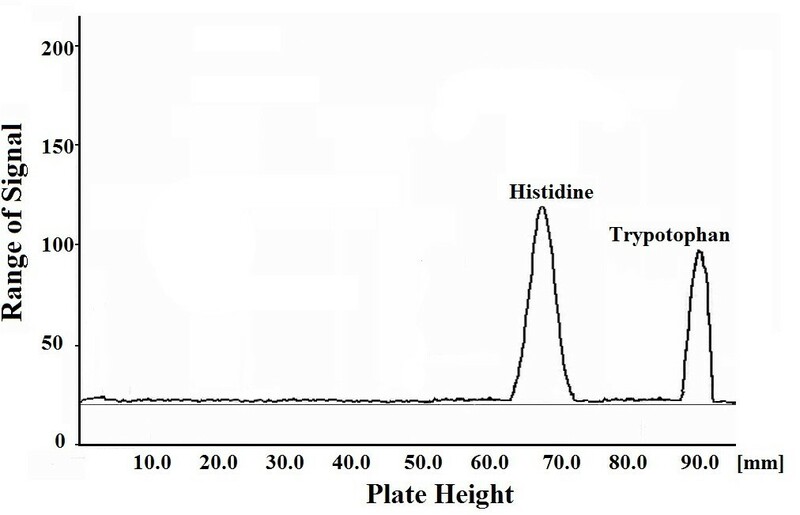 The lowest possible detectable amounts by using M11 as mobile phase were found to be 0.10 μg/spot for proline, alanine and 0.05 μg/spot for lysine and glutamic acid, 0.03 for tyrosine, histidine, methionine, tryptophan and serine. Effect of foreign substances such as metal cations, inorganic anions on separation of amino acids have been examined and chromatographic parameters, Difference between RF values of two adjacent spots (∆RF), Separation factor (α) and Resolution (Rs) have been calculated for representative separations of amino acids (Tables 2, 3 and 4). There was a marginal difference in the magnitude of parameters but separation was not hampered. The result was not the same in case of Cu2+ and Th4+ because these metal ions form complexes with amino acids to form metalloprotiens. This is due to the reason that these metal ions form complexes with the amino acids (Sovago et al. 2003; Nourmand & Meissami 1983). The proposed method was applicable for the identification of lysine in syrup All-B and methionine in drug Beplex forte (Figures 4 and 5). It was also applied for the separation of lysine in syrup All-B and spiked sample (lysine, proline, alanine and tyrosine) and methionine from Beplex forte and spiked sample (arginine, glutamic acid and methionine). TLC system consisting of silica gel as stationary phase and combination of environmentally preferable solvents such as ethanol-70% aqs ethylene glycol-acetone in ratio (5:3:1, M11) as an eluent was found to be most effective for the resolution of closely related amino acids from their multi-component mixtures. The proposed method could be applied for the identification of amino acids in drug samples of pharmaceutical importance. Experimental work was done by AS. All authors equally contributed in experimental design, framing, writing, proofing and approval of the manuscript.